CHICAGO (WLS) -- A bicyclist was attacked last week along Chicago's 606 Trail on the city's Northwest Side. Two men pushed him off his bike in the 1800-block of North Wood Street in Chicago's Wicker Park neighborhood around 10 p.m. Friday, police said. While he was on the ground, a third man cut open his pocket with a knife, taking his wallet and phone. They also took his bike, which is valued at $500. The mugging occurred hours after a man was carjacked nearby. A man showed a gun and demanded the driver's keys and four other suspects jumped in the car and drove off, police said. 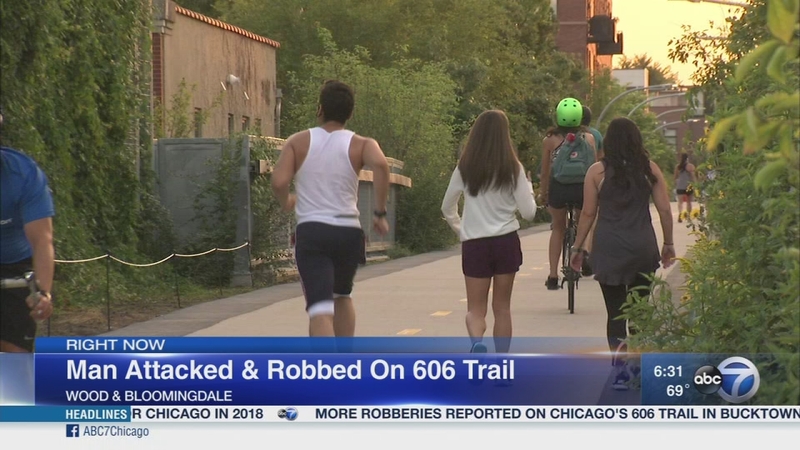 Police issued a warning to the public last week about a series of robberies and attacks on the 606 Trail. They all happened on the weekend, but at various times, between 1:15 a.m. and 5:30 p.m. The crimes have not confined to any one area. The 606 Trail stretches 2.7 miles, from Ashland Avenue to North Ridgeway Avenue. There are surveillance cameras at each of the trail's 12 access points, so some of these attacks should have been captured on video. But police have not released any images. People who use the 606 said they were surprised to hear about these incidents. "There's always so many people around, everybody of all ages. There's little kids riding their bikes, all the way up to elderly people, so it's a big shock," one woman said. "It's just terrible. We've come out here a few times now and I've never felt unsafe walking down here," Kelsey Wenland said, who also uses the trail. No one is under arrest. Anyone with information about these incidents should call police.